Lincoln County Oregon Stepping Up Initiative is Profoundly Transformational! The three of us teamed up a year ago to launch an effort that’s beginning to transform Lincoln County in profound ways. Stepping Up is a national effort to transform the way we deal with people with mental illness and addiction issues in the justice system, but its’ impacts are even more far-reaching. In early 2015, the American Psychiatric Association, Council of State Governments and National Association of Counties came together to launch Stepping Up. Jails and prisons have become the default holding facilities in our country for people with mental illness and addictions issues. It’s estimated that nationally, more than two million people are behind bars primarily because of behavioral health challenges. These institutions aren’t equipped to deal with this population. They don’t get better behind bars; their condition deteriorates. This group tends to get stuck in the system, with longer stays often for relatively minor offenses, making it more difficult to keep people in custody who truly need to be there. It drains public resources, in both the correctional and health care systems, as these people cycle through the system again and again. Is this a problem in Lincoln County? Yes. Our jail holds 161 people. At any given time, about 30 percent of these folks have a diagnosed mental illness, and about a third of this group are severely and persistently mentally ill. This 30% does not include those with addictions issues. Their numbers are growing, yet our total number of jail beds are finite, which makes it harder to avoid releasing people before their sentences are completed. Our goal is not to increase the number of jail beds, but to reduce the need for the jail beds we have. Our county has recognized this issue for a long time. We’ve had a mental health subcommittee under our Local Public Safety Coordinating Council for more than a decade. We have a Mental Health Court, a jail counselor (something many counties larger than us don’t have), and have received a grant to establish mobile mental health crisis services. All of these are positive steps, but we need a lot more. In October of 2016, the Lincoln County Commissioners adopted the Stepping Up resolution, which formally made us part of this national effort. As of this writing, 389 counties have adopted the resolution nationally, which represents more than a third of the total population in the United States. Sixteen of Oregon’s 36 counties are on board. Giving people in the justice system better tools to deal with mental illness is one of our priorities. All members of the Sheriff’s Office and Community Corrections have completed Mental Health First Aid training, a one-day course designed to give everyone tools to recognize and assist in a mental health crisis. The Sheriff’s Office is also accelerating Crisis Intervention Team (CIT) training for patrol and corrections deputies. CIT is a week-long course designed to give officers tools to de-escalate a crisis. 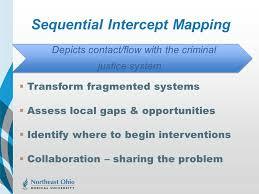 At the end of August, more than three dozen people involved in criminal justice and public safety, along with a number of community partners in treatment, social services, the faith community and peers, came together for a day and a half-long Sequential Intercept Mapping Exercise (SIM). 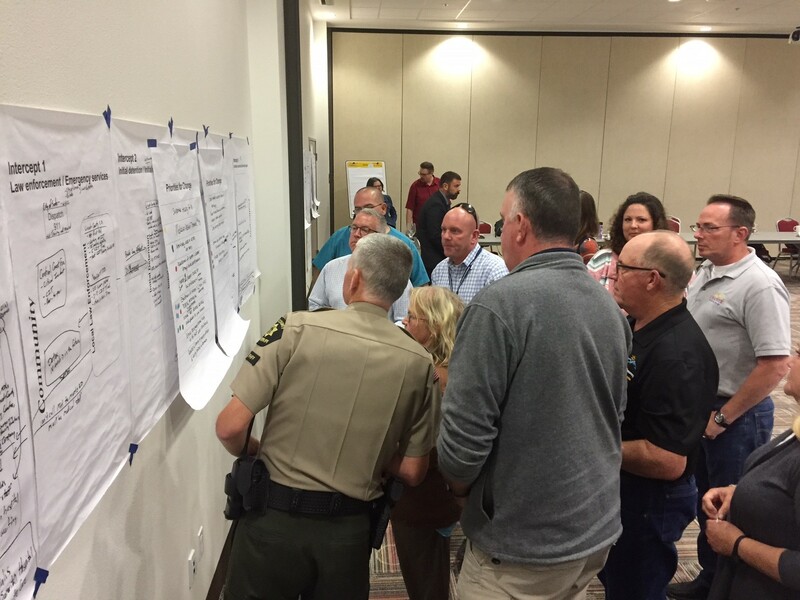 Lincoln County was among 54 counties that applied to receive this workshop at no charge this year: this is a testament to our level of community commitment and readiness. At the SIM workshop, participants assessed our current system at six key points where people with behavioral health issues can encounter the justice system, identified our most critical gaps, and developed action plans to address the first four issues on that list. The four priorities that emerged: establishing stronger pre-arrest diversions; setting up pre-trial services to provide support to people released pending trial and to hold them accountable; a more formalized re-entry system; and the integration of peer services at every stage of the process. We’ve made amazing progress in just a year’s time, yet our work has just begun. We are, however, quite confident of achieving our goals. Why? The tremendous level of buy-in among partners and stakeholders is encourages us greatly. And, it’s been amazing, and sad, to hear from people who are aware of this work and tell us how much it is needed. We have heard too many stories of families, careers and lives shattered by mental illness and addiction. Sometimes it’s a co-worker, sometimes it’s a neighbor, sometimes it’s a family member. Families and communities everywhere have suffered far too long. It’s up to us as citizens to step up and finally end the cycle of damage and begin to heal. 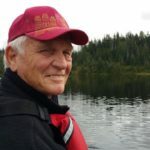 This entry was posted in Uncategorized and tagged #bill hall, #communitybuilding, #curtislanders, #healing, #lincolncountyoregon, #mentalhealthawareness, #recovery, #steppingupinitiative, #stevesparksdepoebay on September 16, 2017 by stevesparks. It has been a lifetime honor and privilege for me to help our community of Lincoln County Oregon launch this important initiative. 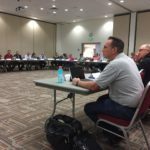 Since the Lincoln County Board of Commissioners passed a resolution on October 5, 2016 to start the formal process of implementing the Stepping Up Initiative, we have been hard at work to win public and stakeholder support to build a community owned treatment continuum that effectively diverts those with mental illness and addiction from being incarcerated in the first place. As a community, we have ignored our responsiblity of caring for our less fortunate citizens for many generations. For decades we have pushed folks with mental illness and addiction into County jails because being arrested and incarcerated was the only public safety option. We have been grossly under resourced in communities all over America because we have failed to step up as a community to fix a problem we clearly own. We delegated our moral responsibility to law enforcement, criminal justice, hospitals, and public health resources for the last 40 years. Along the way with hard lessons learned, we discovered that the longer term solution must be owned by local communities as a family of peer support and services specialists, who are much better at intercepting our friends and family members who are suffering from medical and mental health illnesses, and addiction. We can do this work far better and at a much lower cost than our local government institutions. To help my readers with where we are in Lincoln County Oregon with the Stepping Up Initiative, following is a report submitted on August 1st that shows where we are and where we are headed. It is a very exciting time in Lincoln County and in other counties in our region to know that we are changing with a sense of urgency. Quality preparation for the GAINS Center, Sequential Intercept Mapping (SIM) workshop on August 29/30 paid big dividends! The attendance and participation far exceeded expectations. Most importantly, everyone who attended the workshop came ready to be engaged in a meaningful way. Everyone who has been involved in the leadership and planning for the Stepping Up Initiative and the SIM workshop planning this past year are just outstanding and professional in every respect. We are well positioned to move forward with the post SIM priorities voted by participants during the workshop. I will review these critical actions in this report, especially the top priority, intercepts 0-1. Over 40 community stakeholders and treatment providers attended the SAMHSA GAINS Center Sequential Intercept Mapping (SIM) workshop on August 29 & 30. 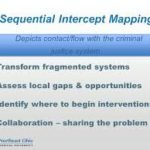 Sequential Intercept Mapping (SIM)…click image to expand. The GAINS Center, Policy Research Associates, workshop facilitators, Travis Parker and Ashley Krider will prepare a detailed Sequential Intercept Map (SIM) tailored after the workshop outcomes presented as priorities above. We have very detailed and measurable post SIM forward actions developed in breakout groups during the 2nd morning of the workshop. In the coming weeks and months, the breakout work teams will continue to be engaged in the process. The excellent professional support from Policy Research Associates and facilitators, Travis Parker and Ashley Krider, will continue as we implement a sustainable strategic plan for Lincoln County that includes participation and collaboration from tri-county partners, Linn and Benton Counties, Samaritan Health Services Hospitals, Samaritan IHN-CCO, and a diversified group of community treatment stakeholders. All are dedicated to building a community treatment continuum that addresses the larger needs of jail diversion, jail re-entry transition, mobile crisis response and peer support services. After the workshop, it was abundantly clear that we are all on the same team. As we all know, the funding environment is highly competitive. 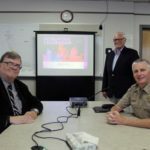 The Stepping Up Initiative, especially the completion of the highly regarded SAMHSA GAINS Center Sequential Intercept Mapping (SIM) platform, will open funding opportunities for Lincoln County and LBL tri-county that we were previously not prepared to compete effectively and win support from diversified funding sources. One such example we are looking into right now is the Laura and John Arnold Foundation RFP, just released. We now know that private foundation funding is very much in the mix as we build a competitive public private partnership business strategy. 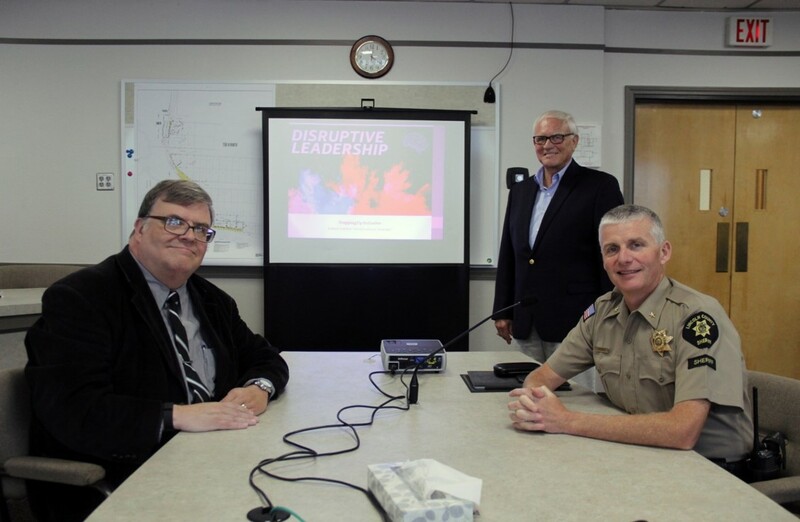 My work continues to include high-level interactions with community stakeholders and tri-county partners to strengthen collaborations and build awareness. Commissioner Hall and Sheriff Landers along with other team members have joined me consistently in various community venues, meetings, and radio programs to spread the word. We are receiving much more media attention as well. We are attracting more volunteers and attention from higher education. 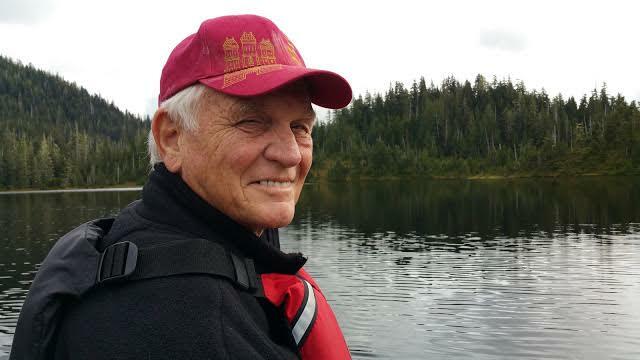 Keith Nelson, a retired IRS/DOJ professional has been volunteering his skills on baseline data collection and connecting Lincoln County to higher education resources at Washington State University, Criminal Justice, in Pullman and potentially OSU. Shelby Houston, a Creighton University graduate student, is completing her practicum with Lincoln County Community Justice and Probation under the guidance of Suzi Gonzales and Jennifer Landers. LPSCC MH subcommittee, MHAC and APARC advisory groups are very important forums as well. I personally and professionally enjoy the outreach role very much and appreciate the opportunity to reach out to our broader community. As your Stepping Up Initiative project consultant, I couldn’t be more pleased with the leadership commitment and support this past year since the Lincoln County Board of Commissioners passed the Stepping Up Initiative Resolution on October 5, 2016. I have been able to do this work at a very high professional level with very few roadblocks. The wind is at our back as we move forward with the post SIM workshop action plan. We have the passion and motivation among all stakeholders to move to a sustainable business plan. This entry was posted in Uncategorized and tagged #addiction, #GAINSCenter, #jaildiversion, #jailreentrytransition, #lifeaftertrauma, #lincolncountyoregon, #mentalillness, #peersupport, #policyresearchassoc, #SAMHSA, #steppingupinitiative on September 2, 2017 by stevesparks. 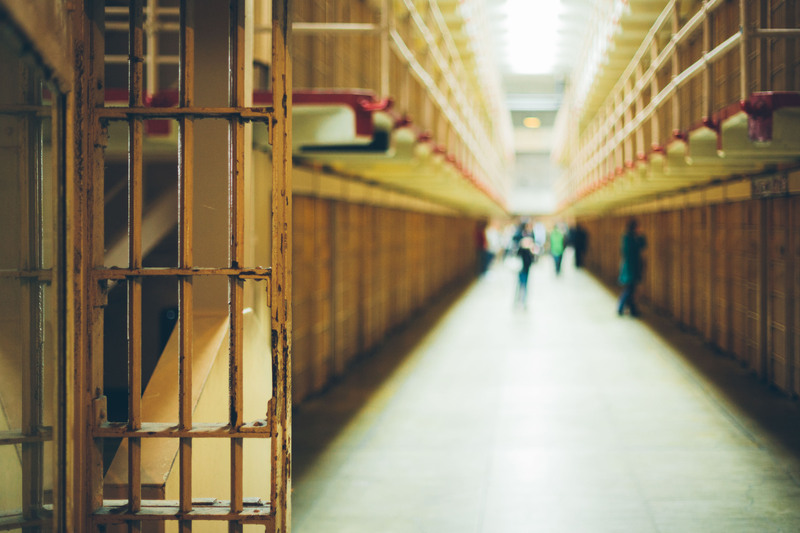 Each year, there are an estimated 2 million people with serious mental illnesses admitted to jails across the nation. That’s equivalent to the populations of Vermont and New Hampshire—combined. Almost three-quarters of these adults also have drug and alcohol use problems. 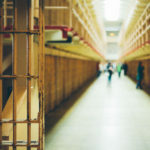 Once incarcerated, individuals with mental illnesses tend to stay longer in jail and upon release are at a higher risk of returning to incarceration than those without these illnesses. The Stepping Up Initiative Click here for this important message…a short video clip. I want to recognize the heroic, passionate, and tireless work of our law enforcement, emergency services, and public health community in Lincoln County Oregon, and elsewhere in America! It is an honor to know the top professionals who work each and every day on our behalf who have done so much for so long to create better conditions for the care of those in need who risk ending up on the wrong side of the law. Please thank those in uniform for their service each time you see them. I had the opportunity as a citizen of Lincoln County Oregon to visit our County Jail in Newport Oregon to see for myself what is considered a crisis in America that we must fix. In our beautiful coastal community of Newport, Oregon, we warehouse people, upwards of 35% of jail population, with a variety of mental health and substance abuse illnesses. This unfortunate circumstance started to evolve way back during my childhood when we were closing down institutions for the mentally ill, forcing the challenge and responsibility back to our local communities, as we well should. But the only place to send these troubled and challenged souls in our community has been to jail, period! We were never prepared to provide adequate and humane treatment, transitional services or housing to help those who are sick to return to a healthy, responsible, and productive quality of life. Lincoln County Oregon is a small rural county among 4000+ counties in the United States of America. A crisis now exist at a critical mass that is completely unacceptable in America by our own well established moral obligations as well as constitutional rights. The law enforcement community has been screaming about this for many years to little or no avail until now… The Stepping Up Initiative was formally launched during a summit in Washington D.C. this past April 2016. 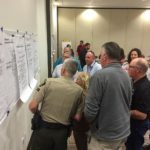 Each and every county in America is in the process of launching the Stepping Up Initiative, including Lincoln County Oregon. 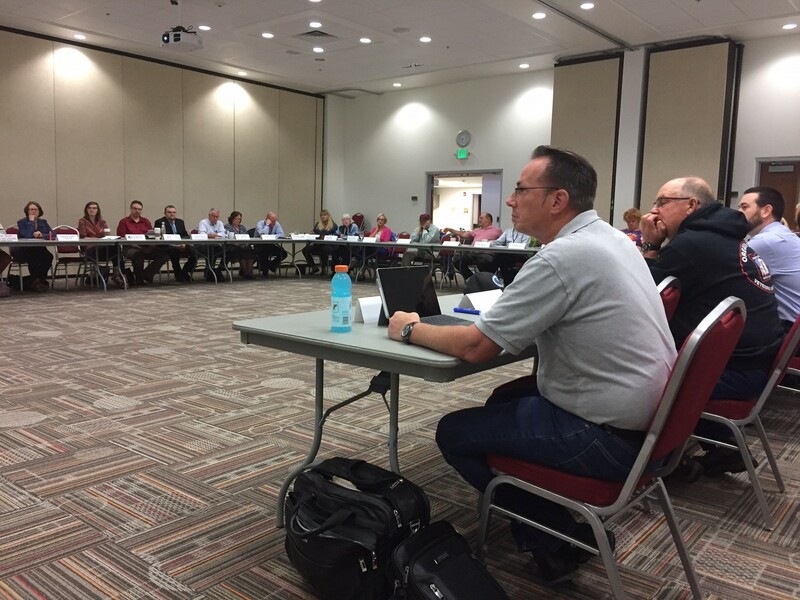 I’m proud and honored to have been invited to join the Lincoln County Oregon Board of Commissioners team, as a project consultant, to help guide the County in building a community wide collaborative strategy and implementation plan to launch the Stepping Up Initiative. This effort is a true call to action by all citizens and stakeholders of Lincoln County Oregon and for all counties in Oregon and across America. 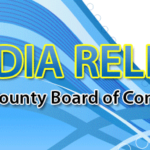 I plan to provide updates on our progress in the County using this website as a platform for outreach on this important topic. Mental Health affects children and families everywhere. Some families suffer for a lifetime without treatment or care. We must build the capacity to take back our innately human responsibility to care for our citizens who are not able to care for themselves. We must help our fellow citizens and neighbors get back on their feet so that they have the same opportunities in life to realize dreams of good health, happiness, and success as the rest of us. We can no longer ignore the inhumane conditions in our jails and prisons that we most often do not even see for ourselves, so we do not know. I know now after a profoundly meaningful and emotional visit to our own Lincoln County Oregon Jail in Newport Oregon. Please feel free to engage with me as I go on this new journey of public service in Lincoln County Oregon. You can do your part by sharing this blog post on your own social media networks. Start the conversation with friends and neighbors to reform jails and prisons…it is our duty to fix. You can also help directly as volunteers in your own community to make a difference at the local level. This entry was posted in Uncategorized and tagged #criminaljusticesystem, #Latest #PTSD #PTSDchat #Survivors #Trauma, #lincolncountyoregonmentalhealth, #mentalhealthjails, #NACo, #steppingupinitiative on August 13, 2016 by stevesparks.